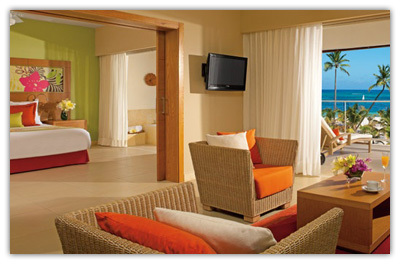 The Secrets Royal Beach Punta Cana features 465 luxurious suites with modern furnishings and deluxe amenities. All suites include individually controlled air conditioning, ceiling fans, nightly turndown service, a full marble bathroom, hair dryer, bathrobes and slippers, Gilchrist & Soames bath amenities, direct dial telephone, bathroom scale, CD and DVD player, daily refreshed mini bar, radio alarm clock, flat screen TV with cable service, coffee and tea maker, electronic in-suite safe, iron and ironing board, 24 hour room service, wireless internet access (surcharge), and a furnished balcony or terrace with a Jacuzzi. 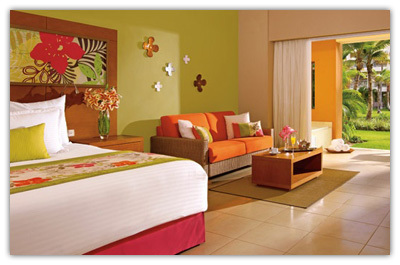 Junior Suite – Features one king or two double beds, a marble bathroom, a separate sitting area, and a furnished balcony or terrace with a Jacuzzi and tropical or pool views. 570 square feet. 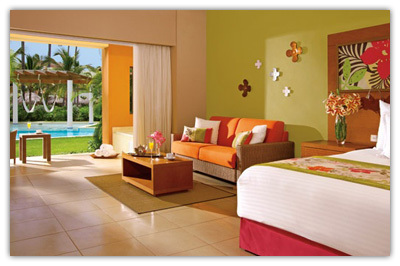 Junior Suite Swim-Up – Features one king or two double beds, a marble bathroom, a separate sitting area, and a furnished balcony or terrace with a Jacuzzi, direct access to the main pool, and tropical or pool views. 570 square feet. Junior Suite Ocean View – Features one king or two double beds, a marble bathroom, a separate sitting area, and a furnished balcony or terrace with a Jacuzzi and fabulous ocean views. 570 square feet. Presidential Suite – Features one king or two double beds in the master bedroom, a separate living area, a master bathroom with a Jacuzzi, and a large terrace with a Jacuzzi and stunning ocean front views. 1,270 square feet.